I have recently discovered the Channel 4 series SuperScrimpers - HOW did I not know of this before? This treasure trove consists of (almost) four series chock full of tips to save money, from big things like debt management to the teeniest tiniest penny. I can feel myself becoming even more of a penny pincher by the episode, and I'm really looking forward to trying out some of the many tips. The first one is something I can do on a regular basis. Many of the tips revolve around getting a little more use out of something before throwing it away. I use tin foil to cover food portions every week. This is becoming less and less of an issue as we slowly build up a collection of plastic tubs to keep food fresh but there are still days when tin foil is the best option. 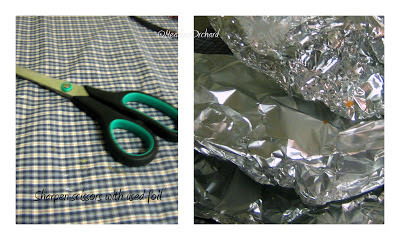 Before throwing the tin foil out, fold it up several times and cut it up into thin strips with an old pair of scissors. This will help keep the blades sharp. Obviously I'll need to do this over a period of time to really see if it works, but for now I am adding in this quick additional step before disposing of any used tin foil.